We live in the 21st century and we are used to complete, unparalleled control in all portions of our lives. We can close the garage door miles away from our home if we forgot to, we can look at our phones to tell if we want to open the door for the person standing on our stoop or not, and we can even install a lock that allows Amazon delivery people to place our more valuable packages inside our house if we need to. There’s no reason at all that you should ever not be in control of the temperature in your home. If you enjoy the heat to be up closer to 78 degrees or the air conditioning to keep your home at a chilly 63 in the summer, that’s totally up to you. Except for, of course, when it is no longer up to you and you’re suddenly thrust at the mercy of the machinery that you once controlled. Fear not! For the valiant HVAC technicians at Valiant Air are ready to be your white knight on the horizon. All you have to do is sound a call of alarm and we’ll be on our merry way. In the meantime, while you’re waiting for us to arrive, or if you’re going to attempt a DIY project with your air conditioner, we have a few tips to help you diagnose the problem. If you the following don’t fit the bill for your problem, you can always check out the part one to this blog. Why Is There No Cool Air from the Air Conditioner? You’re flipping the switch, you’re frantically trying to adjust the thermostat up and down hoping to trigger something, but it’s just not working. “What’s wrong?” you yell in a shrill panicking tone. You’re probably looking at a dirty or blocked air condenser. First, venture out into the oppressive heat and search the area around the AC unit for any potential obstructions to the vents. Pull the weeds, trash, and other debris to clear the air circulating around your unit. If that doesn’t solve your problems, try checking the filter on the unit. If the filter is dirty it’ll often restrict the air to the evaporator coil and the coil will often freeze in response. If you run the AC a lot and/or have pets, then you’ll probably need to change that filter more often than other folks will. Pluck the filter out of the unit and see if you can see through it. If you can’t, then it’s definitely time for a new one. 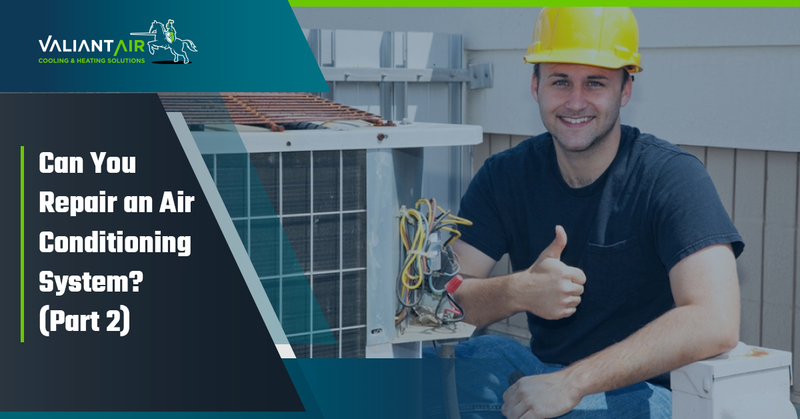 If it continues to not cool the air in the house, there’s probably a problem with the refrigerant or the compressor and both of those projects require a licensed HVAC’s technicians eyes. Why Is it Still No Cool Enough? If your air conditioner is working fine and still not bringing the temperature down enough to calm your boiling nerves and cool your sweating skin, then it’s probably not big enough for your house. Before you start frantically flipping through a Sears article, keep in mind that the average AC unit is equipped to keep your home cool on the average summer day. That generally translates to around a 20- to 25-degree difference in temperature between the inside and outside. Essentially, if you’re hoping to keep your home at a cool 63 degrees when it’s 105 outside, you’re just out of luck. However, if it’s an average summer day and temperatures outside are ringing in at around 80 and your air conditioner can’t keep up, you might have an issue with the frozen evaporator coil. You’ll see signs of this if you can see icing on the outdoor unit. If you find evidence of that, you’ll need to shut the unit off and call an HVAC technician. You may also have to resort to a getting a bigger and better cooling system for your home if the air conditioner isn’t able to keep up with the square footage of your home. If you’re faced with an issue that you can’t solve on your air conditioner, reach out to us. We’re here to ensure that the occasionally harsh weather of Northern Colorado doesn’t get under your skin when you’re trying to relax at home. We have more than 30 years of combined experience to back our professionals in their quest to provide temperature control to the whole of the Front Range. Schedule your appointment today.